Cockermouth residents Gemma and Hugh Carter's home was badly hit by the worst flooding ever to hit Cumbria. It is the second time their house has been flooded and forcing them to move out. They are currently living in temporary accommodation whilst they try to clean up their home. "I spent Christmas at my parents' home six miles down the road. It was nice - under the circumstances - and a white one too, which was lovely. We know from out previous experience of flooding that things come to a standstill in the first few weeks after the initial mucking out. We've been trying to get as much ready as we can so the refurbishment work can start in the new year. I'm hoping we will receive a 'dry certificate' from the restoration company next week, and then all the work can commence. Some people suggested we were lucky to have our house refurbished on the insurance. I have to disagree. There is nothing on this earth that is worth the psychological impact of watching you home fill up with water. We've spent a lot of time looking at refurbishment options that will mean minimal damage next time we're hit by a flood. It's felt completely different to the last time we had to restore our home less than 12 months ago. Last time it was quite nice to piece the house together from a blank canvas. This time part of me questions the point of doing this work if we're going to be hit again next year. We have chosen tiling for the whole of the downstairs floor and a kitchen where all the appliances are raised above waist height. Cupboard doors and large drawers below waist height are all removable to minimise future damage. We are doubtful of getting insurance in the future so we have to prepare for the worst. We simply won't have the finances to restore the property to anywhere near the same level as the work being carried out now. This is something we are very worried about. Cockermouth is very slowly coming back to life. But I emphasise 'slowly'. The main street and several routes in are still inaccessible to vehicles. Some shops have been able to relocate to premises nearby, which has benefitted many in the lead up to Christmas. I am glad to see the back of 2009. It's a year that, even without the flood, I will gladly put behind me. Hugh and I have wanted to start a family for two years now but things haven't been as straight forward as we'd hoped. At the forefront of my mind is my father's constant battle against motor neurone disease. He was diagnosed in February last year which was a shock to all of us. During the last flood he was a DIY genius. This simply isn't going to be possible this time around. He is now having to accept the wheelchair aid that he has tried so hard to put off. I only hope we can lift his spirits with the grandchildren he has been looking forward to for so long. "Our home has gone very quickly from disaster zone to building site. The house was striped out and the insurance company was very prompt in getting started. A restoration firm and loss adjustor came round and together they examined the extent of damage. 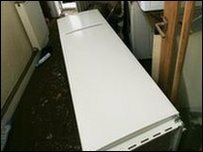 More or less every major appliance in the kitchen has been designated 'Beyond Economic Repair'. We also had to claim for lots of smaller things like all the crockery and glasses which floated round the kitchen before getting smashed. The restoration firm have scrapped out all the mud, ripped out sodden carpets and put drying machines into the house but it's still really dirty. We don't know the full extent of the structural damage. The staircase might have to go. I went to a local flood action meeting and there's a strong feeling of frustration among the residents. Some people have been flooded for the third time. 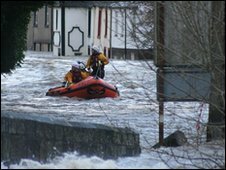 How many more times will we have to be flooded out before the authorities take action? Last week I was feeling overwhelmed. Adrenalin and the support of friends helped me get through the initial shock. Now the reality has begun to sink in. There have been lot of tears this week as I come to terms with things. The road outside is still covered with mud and muck. Many bridges are still closed. People have definitely become grumpier and more impatient. I went back to work at Cockermouth Secondary School on Monday. The school had been closed since 19 November. The flood has affected almost every pupil. Some are finishing early because it is now takes them one-and-a-half hours to get home. We are gradually sorting out our temporary accommodation. I visited a local housing association, Impact Housing, to get some furniture. We now have a sofa and chair. Friends have helped us with a fridge and toaster - it's all the basic things that we really need. Actually, our friends thought we needed cheering up - so they kindly clubbed together to buy us a weekend in Edinburgh. We're going next weekend - I can't wait! Some things in Cockermouth are improving. Shops have relocated to temporary premises. On Friday the Christmas lights were belatedly switched on and we even went to a beer festival." "We both went back to look at the house when the floods subsided. Inside it's covered in an inch of silt and smells disgusting. The floor is littered with debris. There's simply no way we could live in the house at the moment. 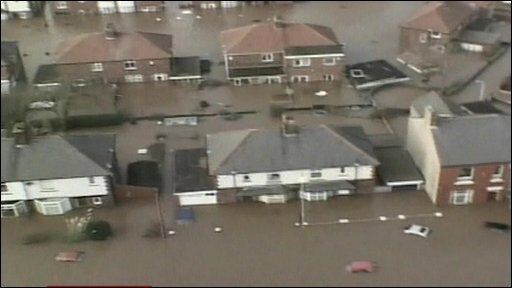 It's especially difficult as we had only been back in our home for six months after getting flooded out in October 2008. It took us until May this year to finally get everything repaired following that flood and we were looking forward to Christmas at home. We're staying with my parents at the moment. Fortunately we have managed to find a flat to rent but we still need furnish it. 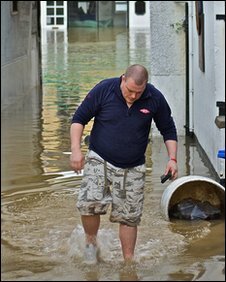 I think that it will take even longer to repair our home this time because the flooding was so widespread there will be more demand for tradesmen. It's hard to be optimistic but we must try. Some people on the scene on Thursday really helped us to see the positive. It was my birthday on Thursday - and it must have been the worst birthday I've ever had! Despite this, some of the people who helped us that day managed to put a smile on my face. Thanks to our neighbour Sue Cashmore - not just for alerting us to the flooding on 19 November at 0700 - but for embracing the role of coordinating our local flood action group since the 2008 flood. On the morning of the flood, my husband, Sue and other neighbours from a few doors down sat and tried to be as light-hearted as possible with regards to the huge upheaval we were about to endure. We even contemplated birthday cake. It helps in these situations to still keep a sense of humour alive. Later on, I tried to leave the house and join my husband helping the neighbours out. The water was too deep by then and I struggled to hold the water back. I closed the door immediately and had to lock it to try stop the door gaping at the bottom. A little distressed that I was on my own with rising water levels, I climbed up to the window and leaned out to call my husband. Wading down the road with water round their waists, were my two great friends, Jo and Natalie. I was crying and inconsolable. They climbed in through the window, and gave me a big hug. Determined to celebrate my birthday, we went upstairs and sat on the floor with a drink each and a box of Pringles, while the water poured in downstairs. Since our clothes were all wet, we had to sit in our underwear. Despite the memory of water rising in your own home and the aftermath we would all face, it is the memories of my friends, neighbours and family and their effort that I'll remember." Can you stop bridges collapsing?